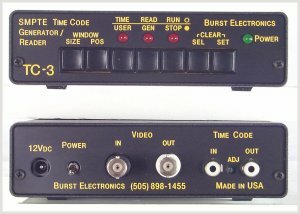 The TC-3 SMPTE Time Code Generator/Reader allows the standard Video SMPTE Time Code to be generated on and read from 8 mm, 1/2", 3/4" or 1" tape. Features include ability to generate window dubs, drop frame and field 1 indicator, plus a jam sync mode. The high legibility characters have user adjustable position and size, allowing for flexibility in the video display. The TC-3 also has selectable auto backtime of 0:30, 1:00, 1:30 and 2:00 minutes. The longitudinal time code can be recorded on an audio channel or a separate time code channel, if the recorder is so equipped. The time code then can be read back at play speed. 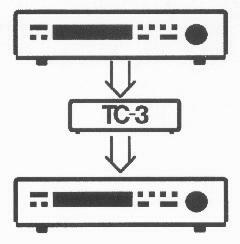 Options: S-video (Y/C) format as Model TC-3YC, Rack mount.